I never quite got this quilt out of my system. I knew I wanted to explore it a bit more. I also wanted to try using two background colors together that were very similar in value. The pink is a Kaffe Fasset shot cotton which I love, although unfortunately I can't tell you the exact name. I would use shot cottons as my solid all the time if I could. Yes, they are a bit lighter weight, and they fray easily, but I just love the texture and feel of them. So soft! I really wanted to link up with the Blogger's Quilt Festival this year, so that's why I'm posting again. I know I've been pretty busy here the last week with the Value Quiltalong! So if you haven't checked out the festival, please do! It's just a big bunch of amazing quilts all in one place! I love everything about your quilt. Very inspring. Stunning. I love the two colored background. I'd probably use shot cottons all the time too, if I could afford them. This is lovely, Jolene! Soft and subtle, but so modern and fresh. I like the contrast between the soft background colors and the bright triangles. What a pretty quilt - well done! Beautiful quirky, love the triangles. I love this! The pink gives such warmth to the look of the quilt and I like how the triangles vary in their layout. Great quilt! Beautiful! Love the randomness of the pink. Gorgeous. Love the pink triangle up on his own -so fun! Great quilt! I love these triangles! beautiful~love how the colors pop against the white :) it looks so cozy!! wow, I so love this quilt, I'm totally smitten with your two background colors, what a genius idea!!!! I love the light pink added in! Love it! I think that the pink and white background is so clever! Very soft and subtle, yet fun and sparky at the same time. Love this quilt! I just realized this week with the value quilt along that you've re-started blogging on a regular basis. That is great. I particularly love your Brrr! Triangle quilt. This variation is also really nice. It looks so soft with the pink shot cotton. I love the subtle background pieces... so beautiful! 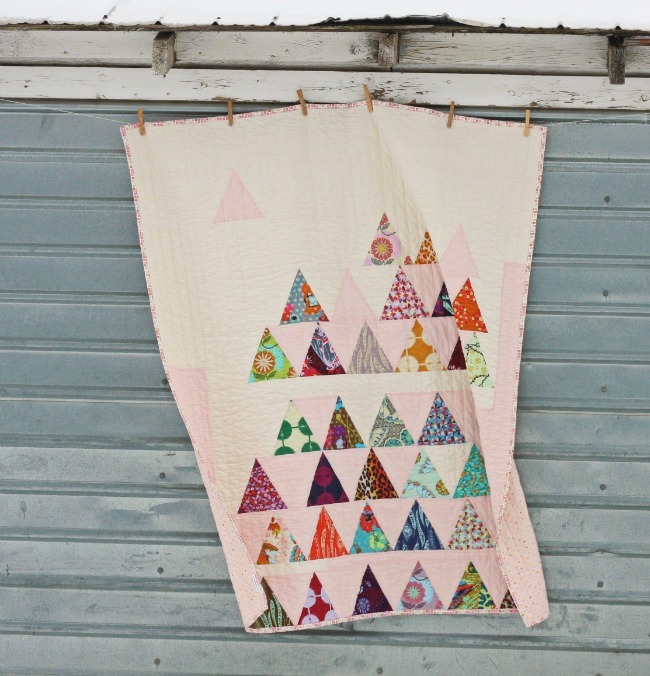 I like the use of triangles in this modern baby quilt. That pink shot cotton you used really softens it up. Pretty. Beautiful - love the soft pink background and the splashes of colour from the pretty triangles. I see how the triangles are put together but what about the solid part of the quilt? I really love your placement here especially mixing the white and pink backgrounds. It's interesting how there is so much diversity in this lime and you used on,y one of each that it looks scrappy. Very pretty! Love the simplicity of the design, And the two shades of background adds a lot of interest. Congratulations on a lovely finish! Really like this quilt. I can imagine putting in all your favourite pieces, and the background makes it interesting being two colours. Lovely! So gorgeous, I love the shot cotton! That pink is perfection. I love this quilt! I love love love love love love this quilt! Your color combinations are just amazing! 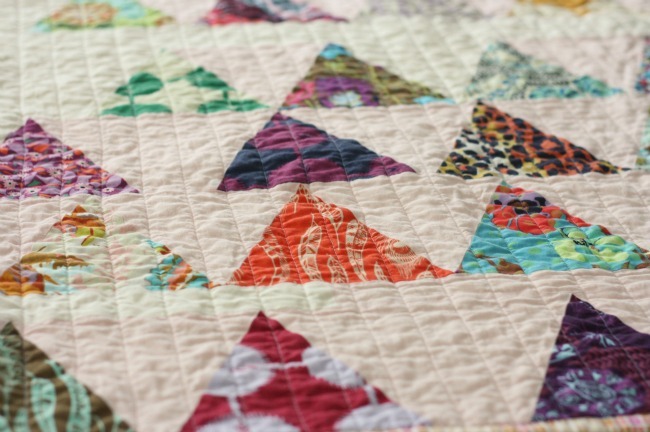 I love the way you make triangle quilts! since you posted about the brr!triangle quilt!! Pure love at first sight! This is so beautiful! You are such an inspiration! it looks so vintage! i love it! gorgeous, as always! 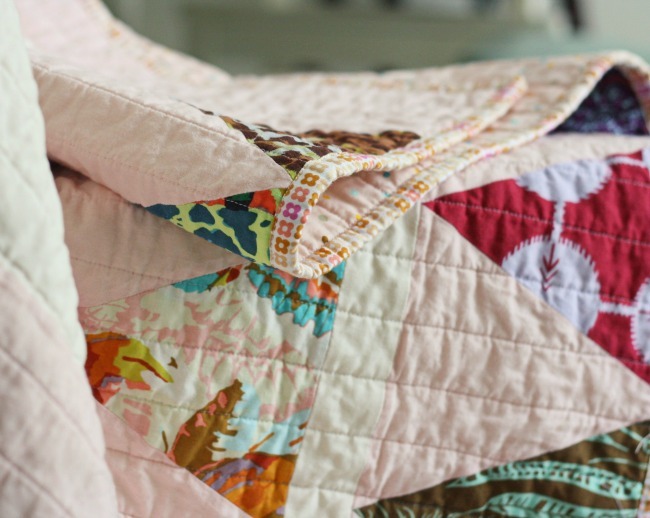 thanks for mentioning our little shop :) I want to give this quilt a go sometime. It's been on my mind since your Brrr quilt! I am in love with triangles. Is that a pattern I can buy please? I LOVE it and so want to make it please please please. This is so beautiful! Wouldn't that be awesome for a baby girls nursery? oh, brilliant idea to use two similar shades for the background. I love the way you spaced the triangles. I so wish you would make this a pattern...I love it! I am beyond obsessed with this quilt... I want to make one! Sooo good!